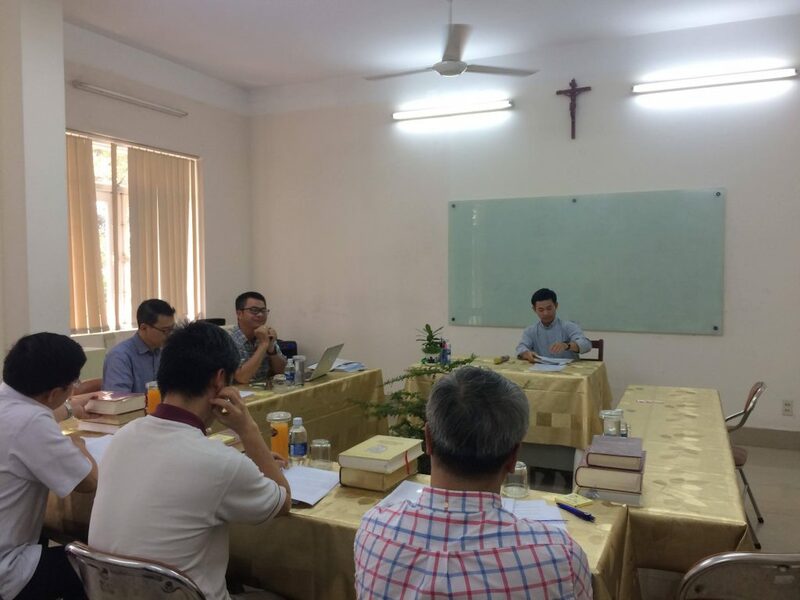 On two days, 21 and 22 of March 2019, the 4th year theologians of the Saint Joseph Jesuit Scholasticate (SJJS) of the Society of Jesus in Vietnam, took the oral dogma comprehensive examination before a committee of three examiners who are currently professors of the SJJS. Examiners were Rv. Fr. Nguyễn Hai Tính, SJ (STD); Rv. Fr. Nguyễn Tiến Dưng, AA (STD) and Rv. Fr. Phạm Quý Trọng (SSL, STD). Besides, Rv. Fr. Nguyễn Thái Sơn, SJ, dean of theological studies, was designated as the time keeper. Especially, it was also pleased for all examinees and audiences because of the presence of Rv. Fr. Hartono Budi, SJ, representative of the Loyola School of Theology, Philippines with which the SJJS has been affiliated recently. Br. Trương Hoàng Sơn, SJ. Those who took the honors comprehensive examination had to spend a 90-minute examination before a board of three professors and Fr. Budi while other students took a 45-minute ordinary comprehensive examination. They were all required to show their knowledge on overview of the whole STB program. Each examinee was also required to submit a final synthesis and a research paper on dogmatic theology. May Jesus Christ, our Lord, grant the professors his grace so that they are able to fulfill their mission of teaching; also, keep the examinees in His love in which they can draw the dynamic to serve others.